The 4th of July is my all time favorite holiday. I love fireworks, barbeque's, summer, and spending time with family and friends. Even though it is my favorite holiday, I don't have any decorations. I know, pathetic! Well, this is the year to start! First I made my own pillow form using this awesome tutorial from Honeybear Lane. Can you believe how expensive it is to actually buy a pillow form? I think the price is ridiculous, I always save my batting scraps just for this purpose. I made my pillow form 15"x15". ﻿Do you remember my Multi-Use Pillow? Well here we are again with another use. I did the exact same thing as before to make the band. 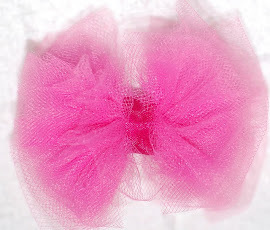 I tied the bow with a scrap piece of fabric. Since I was being lazy I just hot glued the bow onto the band. This literally took me 10 minutes, if even that. Very cute! Maybe next 4th of July I'll have my patriotic quilt finished that you helped me get started on. Let's hope!!! We love having people link to our blog, and you may use one or two pictures as long as you give us clear photo credit. Please don't post full tutorials or copy content from our blog. We love and want to protect our kids. Do not use pictures of them without permission. All our patterns and tutorials are intended for you to make items for yourself or as gifts. Please don't sell them. The ideas and images belong to the blog authors unless indicated otherwise.